for over 25 years now. SHASTA Construction provides talented custom skilled craftsmanship to each project and is dedicated to your needs and specifications. For over 25 years Tom has come through referrals and has been providing a level of personal services, craftsmanship and attention to detail. Our main focus is customer satisfaction. Our millwork shop allows us to customize all your wood working needs. We can match existing historical moldings or add beautiful details to your new home. Our custom millwork can also help you design the wine cellar of your dreams with beautiful mahogany and cherry woods. We will customize and design a beautiful wood wall cabinet together with the customer. 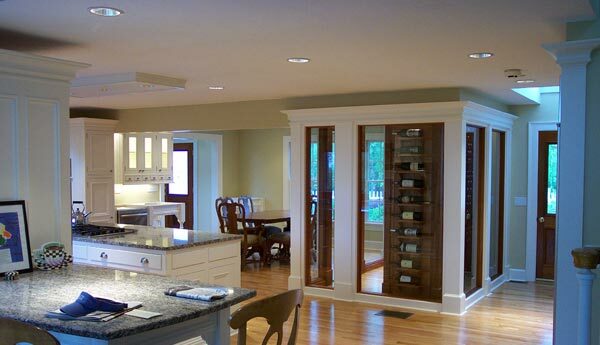 We can provide custom and semi-custom cabinetry, built-ins, etc. Regardless of building space we can maximize your needs and wants as well as making the space functional and decorative. Whether your space is limited or sizeable, we can transform the area to customize your needs for a great theater get away with the family. If your needs are fine wines, we can also customize any small or large space into a wine show room of mahogany, cherry and granite, sure to impress anyone.